I can't wait for the 7th grade end year party this year! But I understand there is planning to be done and I am glad to help! For the catering, it was between Burger Bonanza and Pizza palace. And for the activity (bounce houses), it was between Jumpin' Jacks and Hoppin' Around. Though the prices were close, one seemed to fit more for this celebration. 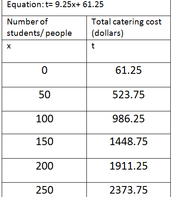 For these prices there was a cost of 10 dollars per student plus a initial catering fee 20 of dollars. 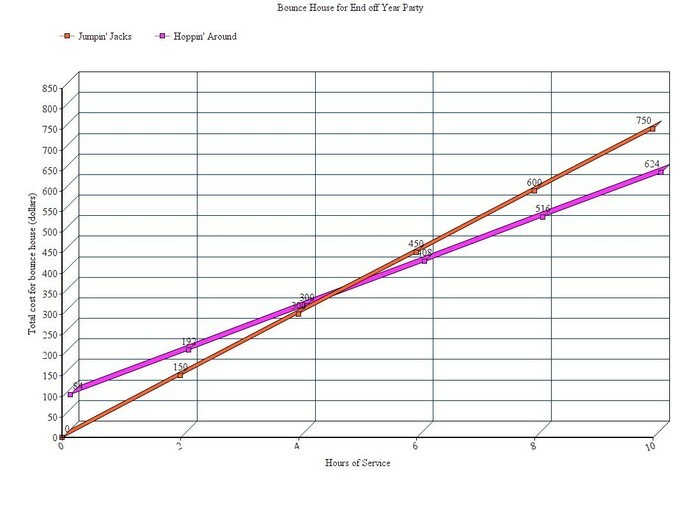 So to calculate the totals, I made a equation. 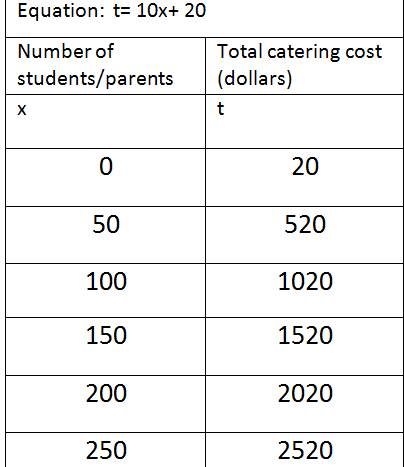 In the equation the 10 represents the price per student and the x represents how many students will be attending the party. While the 20 represents the extra fee and the t is the total cost. The 20 is added since first the amount of students is multiplied by 10 then there is the added initial fee. 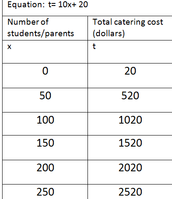 For the second restaurant prices there was a cost of 9.25 dollars per student plus setting up fee of $61.25. 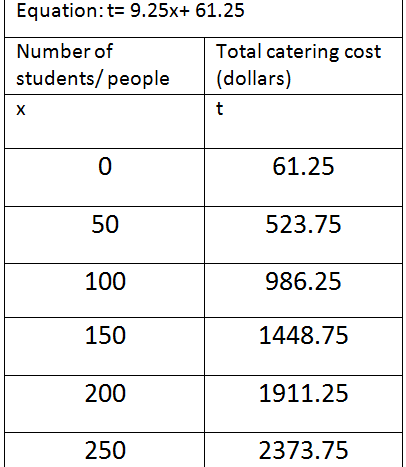 In this equation the 9.25 represents the price per student and the x represents how many students will be attending the party.While the 61.25 represents the setup fee and the t is the total cost. The 61.75 is added since first the amount of students is multiplied by 9.25 then there is the added setup fee. In conclusion Pizza Palace, is a more reasonable catering option. This is because the only time that burger bonanza is better than Pizza palace is when there is 50 or less students. But there is obviously more than 50 7th graders at Pike. For example if there hundred students attending then at the burger place it cost 1020 dollars while at the pizza restaurant it is 986.25 (a 33.75 difference). If we had a budget of 1000 dollars, then for Burger bonanza then we could have 98 students and for Pizza palace we could have 101 students attend the party.No you can not have a decimal or fraction as part of your answer because you can not have a fraction of a student. For this bounce house there was 75 dollars per hour. 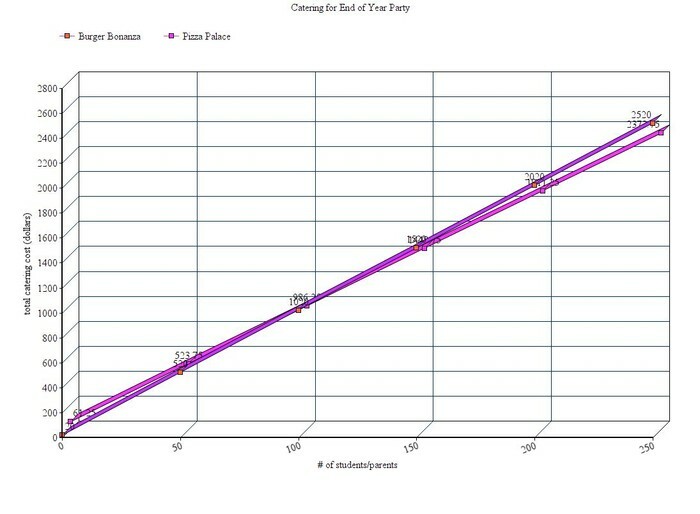 So to calculate the totals, I made a equation. 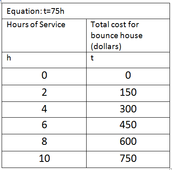 In the equation the 75 represents the price per hour and the h represents how many hours of service during the party. Also, the t is the represents the total cost. For these prices there was a cost of 54 dollars per hour plus setup and removal fee of 84 dollars. . 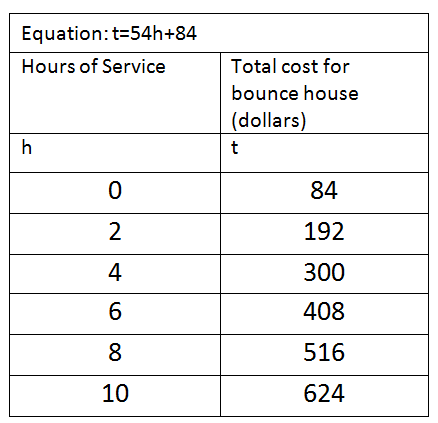 In this equation the 54 represents the price hour and the h represents how many hours of service during the party . While the 84 represents the extra fee and the t is the total cost. The 84 is added since first the amount of hours is multiplied by 54 then there is the added setup and removal fee. In conclusion Jumpin' Jack's is a more reasonable bounce house option. This is because the only time that Hoppin' Around is better than Jumpin' Jack's is when there is 4 or less of service. 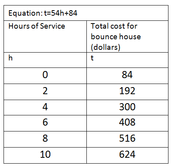 For example if we had a 6 hour party then at the Hoppin' Around it cost 450 dollars while at Jumpin' Jack's is cost 408. Also it is because one school day is eight hours long so we probably won't wait till the very last minute to take down the bounce houses and since if we have both companies for 4 hours it cost 300 from both. But most likely we'll have the bounces out longer than 4 hours. 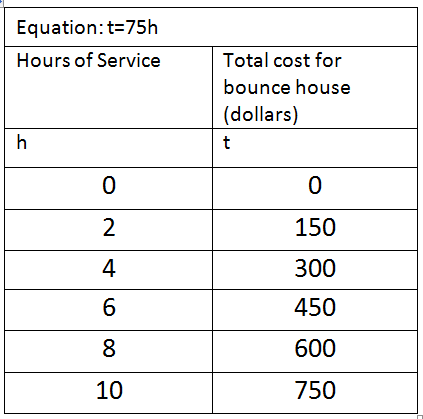 If we had a budget of $750 for the bounce house, the for Jumpin' jack's we could have it for 12 hours and for hoppin' around for 10 hours. Yes, your answer can have a decimal or fraction part of your answer because sine it is time (hours) there can be a fraction/decimal of an hour.